A job in retail has been the friend of many students working their way through college. Ask anyone about their first work experiences and in many cases retail looms large — from seasonal jobs at big-box retailers to late nights behind the fast food counter. But once college is over, do those early experiences diminish or inspire a wider career in retail? 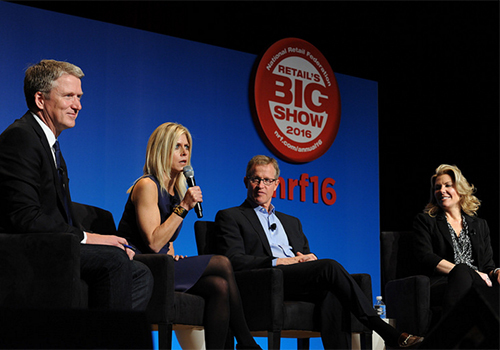 This January saw the fourth annual Student Program of the National Retail Federation’s (NRF) Retail’s BIG Show event. “The purpose of the Student Program is to bring students from around the country together to learn about the retail industry, how to develop their careers and, ultimately, how to find jobs either through internships or jobs after graduation,” says Ellen Davis, Executive Director of the NRF Foundation. 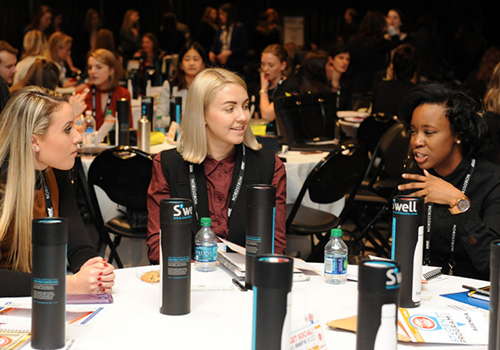 This year’s program brought together nearly 500 undergraduate and graduate students, 85 educators, and representatives from the top names in retail. It also featured a live-streamed event, in partnership with Barnes & Noble College, of the opening keynote presentation with twitter phenomenon, fashion and communications expert, and bestselling author, Aliza Licht, who demonstrated how students can build their personal brand and develop a successful career in the retail industry. The Student Program kicked off with two solid hours of career advice from six professionals who have found success within the retail industry, from social media and supply chain to store management and digital strategy careers. In addition to the students who attended the event in New York, the live stream offered an opportunity for students around the country to benefit from the Student Program, with over one thousand students signing up for the event from Barnes & Noble College’s campus partners. Promoting and developing careers in retail is familiar ground to Barnes & Noble College and, as a Millennial employer of choice with over 10,000 students working in their campus bookstores, more than 80 percent of those booksellers develop into full-time employees, enjoying diverse careers within the company. In addition to its own deep reach of providing careers for students as an employer, Barnes & Noble College is also devoted to helping students develop the necessary skills and resources that they need to be successful in their professional lives through the lens of its Career Now program. Building in a regular resource of information, events and practical advice on job preparedness, the Career Now initiative, now in its second year, is based on Barnes & Noble College’s own research, which revealed that many of today’s students are unprepared for life after graduation. A cornerstone of the program is about educating students that their career preparedness should start early in their college lives — as early as their freshman year — and that has led to a concerted communications initiative. 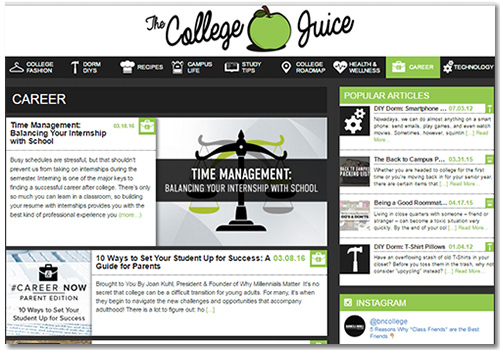 “We’ve been updating our student blog, The College Juice, with regular career content,” explains Barnes & Noble College’s Consumer Marketing Project Manager, Erin Lenihan. “It’s really designed to give students a central resource for advice as they start building their own career strategies,” she says. The blog posts cover such topics as how to make the most of job fairs, advice for parents in helping with career preparedness and balancing a college course load along with part-time work. In addition, the program also fielded career and internship questions from students, and provided resources for faculty to share with students on building their personal brand. There is also a sweepstakes asking students to provide a description of what career goals they aspire to reach. Each of the winning entries will receive a one-on-one career coaching session covering advice specifically tailored to whatever their individual needs may be. But Lenihan is also developing a grass roots component to the Career Now program, which she sees as a key part of the larger Barnes & Noble College mission. “The way we really see the program developing is through opportunities to expand our relationships and strengthen the support we offer to our campus partners,” she says. “We’re not only on campus to support students in their success, both academically and professionally, but we can also be a resource to help college career services departments. We want to communicate to them that they can leverage the bookstore as a space to host events — or as a way to get their messages and initiatives across on a wider platform,” Lenihan adds.